There is widespread agreement among economists that a carbon fee is the most efficient mechanism to reduce greenhouse gas emissions. No other policy lever can match its economy-wide effects in changing investment decisions and individual behavior. For a carbon fee to be most effective, the fee rate must increase gradually until emissions reduction targets are met. To avoid the loss of competitiveness or the shift of industry to economies without carbon pricing, border adjustments will also be necessary. Together, a carbon fee with border adjustments can help ensure that other countries follow suit, bringing us closer to a global solution. 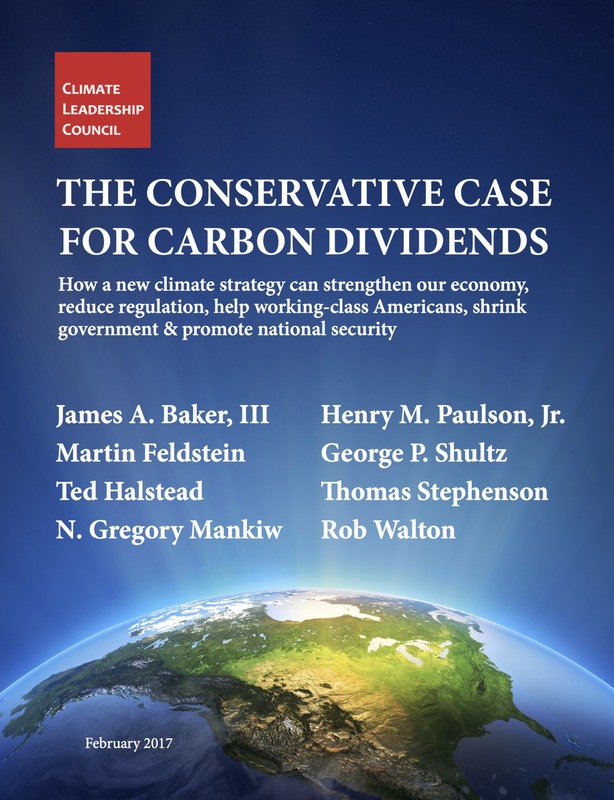 A recent study found that the Climate Leadership Council’s carbon dividends plan would achieve more than three times the emissions reductions of all Obama-era climate regulations from 2016 onwards. The key to making carbon fees popular is a countervailing incentive that outweighs the fee’s burden. The best candidate is carbon dividends, which would put money directly into people’s hands and reward socially beneficial behavior. Simply put: all proceeds from a nation’s carbon fee would be divided equally among its citizens, and returned to all adults through a quarterly dividend check automatically deposited in their bank accounts. Polls reveal that Americans favor this plan by a 2.5-1 margin, including a 3-1 margin among Republicans. The popularity of dividends is crucial not only to the initial passage of carbon fees, but also to ensure ongoing support for gradually increasing the carbon fee rate over time. A common concern is that carbon fees can be regressive, imposing a disproportionate burden on the least fortunate. Pairing carbon fees with dividends solves this problem and ensures that the most vulnerable come out ahead. Distributional studies show that most Americans – including the bottom 70 percent – would benefit economically. The reason is simple: the wealthier tend to pollute more, and would therefore face higher costs. This policy is also equitable in another way: since costs increase in direct proportion to one’s carbon footprint and all citizens receive identical dividends, everyone is rewarded equally for reducing their collective carbon footprint. Given the ongoing weakness of the global economy, an ideal climate strategy would also double as a growth strategy. A carbon dividends plan can assist in three important ways. First, a gradually increasing carbon fee would send a powerful market signal that encourages technological innovation and large-scale substitution of existing energy and transportation infrastructures. Second, rising fossil fuel costs would offer companies the predictability they lack in today’s energy market, encouraging longer-term investment. Third, dividends would have an important stimulatory effect by putting cash in the hands of the end consumers most likely to spend it.